Some time ago, Seviche chef-owner Anthony Lamas mentioned in a Facebook posted how his kitchen staff loved to butcher whole animals such as pigs and fish. 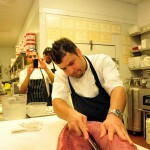 Seviche chef-owner Anthony Lamas breaks down a tuna loin. Thus, the idea for a butchery class was born, and Lamas invited a few press hacks to have a sneak peak at what he’ll offer at future classes. Before I mention that, it’s important to note that Lamas won’t be offering classes to the public and seeing who signs up. It would be costly to order a whole pig or multiple whole fish to butcher and have one person sign up. These are private tutorials where six to 10 people will gather for the experience of learning how to disassemble an entire animal—sans guts—watch how Lamas prepares it and/or possibly leave with a lovely parting gift (i.e. raw product) to prepare at home. Sevichechef-owner Anthony Lamas is planning to offer small group, hands-on cooking classes that will include subjects such as whole hog butchery, salsa and seviche preparation, and whole fish cookery. Each class includes dinner, and custom packages are also available for those who have a specific culinary interest. Classes start at $95 per person and are suitable for groups of five to 20 people, according to a news release. “I hope that the class series will be a great resource for people who like to cook with local ingredients,” Lamas stated in the release. “We have had a lot of interest in particular from people who want to know how to break down a whole animal, so I think that will be one of our most popular classes. I am a social diner. I crave cross-table interaction and I love the background noise of a busy restaurant. Few things twist the tedium tally upward like dining without companions or, worse, eating alone in front of a TV. So I had my doubts about how well Seviche’s “dinner and a movie” night in late July would work … how 11 courses could be enjoyed visually when illuminated only by the flickering light of the video, “El Bulli: Cooking in Progress” … how a team of servers could introduce and remove courses without, well, blocking my view of the show and creating distracting racket … and how my ADD brain could focus appreciatively and simultaneously on both film and food.